Irish saying button badge. This white 25mm badge has the work FECK written in a black bubble font and an Irish lucky shamrock. 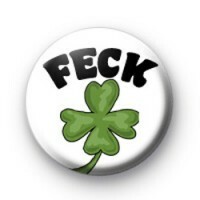 Feck is such a classic Irish slang phrase, it is a fun, cheeky way to use profanity without being offensive. It is the perfect Irish catchphrase and makes everyone smile. Great badge for St Patrick's Day or any Irish themed party. We have so many St Patricks designs in the shop, as well as so many funny Irish inspired badges, that would just get everyone in that party mood. All our badges are proudly handmade in the UK by us.